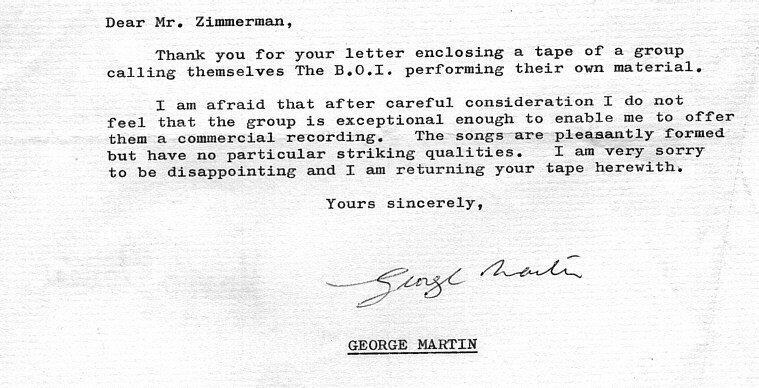 George Martin Turned Down My Band! 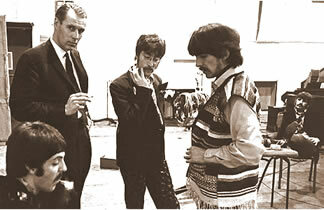 George Martin working with the Beatles on probably their greatest LP ‘Sgt Pepper’s Lonely Hearts Club Band’. The death of Beatles producer George Martin marks the end of an era. 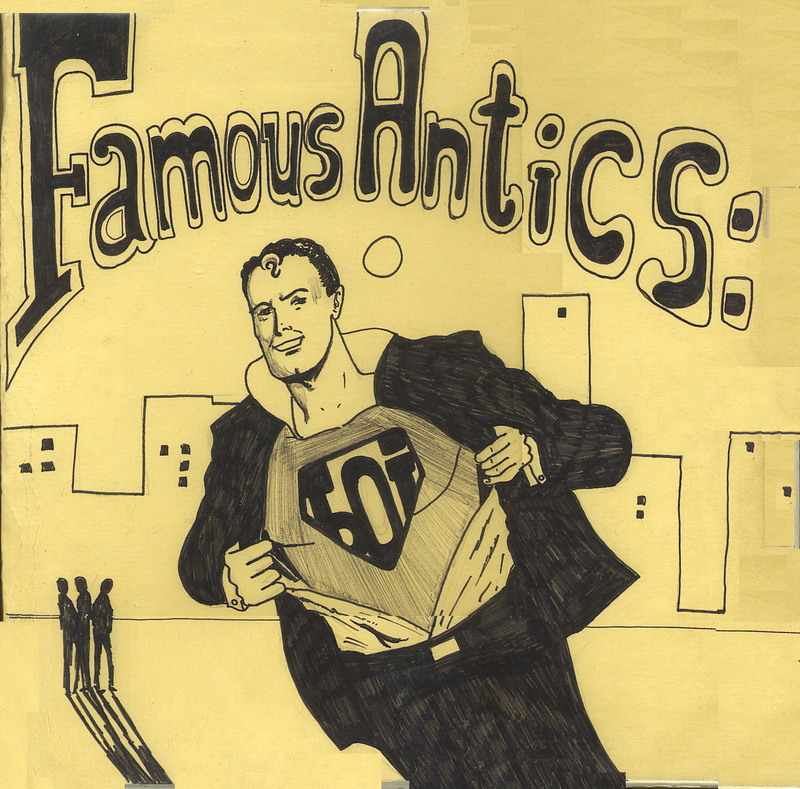 He was as much a part of the Fab Fours’ legend as the lads themselves. Hard to imagine anyone else being able to take the sounds they wanted – and could hear in their heads – and transform them into such wonderful recordings. His genius as a producer provided the soundtrack for my teenage years – from ‘Please Please Me’ to ‘Abbey Road’. Like many of my friends, I lived for music – and counted the days to the release of the next LP by the Beatles. In the ‘60s everyone wanted to be in a group, as they were called before it became trendy to use the term ‘band’. It was only natural that when I formed a “beat combo” with my mate Rog that we would record and ‘produce’ our own albums – and send our best songs off to record labels hoping that someone would sign us up. And the one person we dearly wanted to be signed up by was George Martin. If anyone could turn our raw talent into gold it was him. 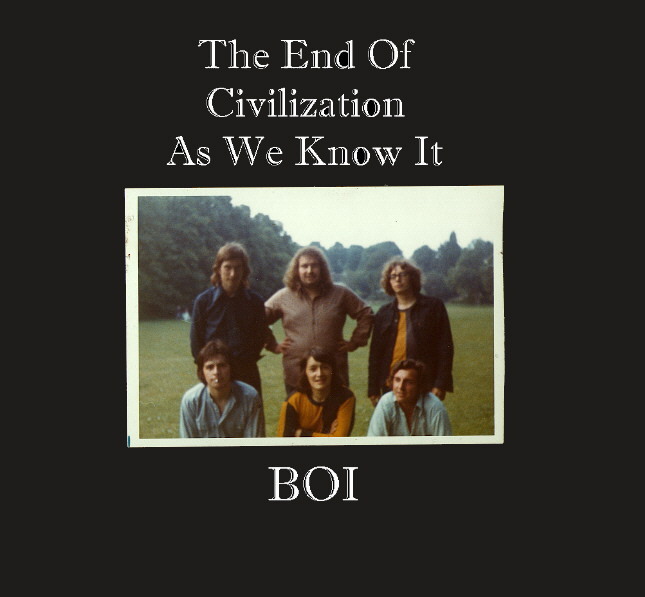 My band, the BOI, was formed after listening to Frank Zappa’s recordings of Wild Man Fischer on John Peel’s radio show in 1969. Freeform and improvised, Fischer’s songs were proof that almost anyone could have a go at making music. So my mate Rog and I had a go even though we had no discernible musical talent whatsoever. Despite this drawback and armed with cheap guitars that cost ten bob, we managed to write some half-decent songs such as ‘Wimpy Bar Loving’ and ‘Paraffin Palace’. Things took a turn for the better when we were joined by Drew Millin who brought with him something new – the ability to play guitar. 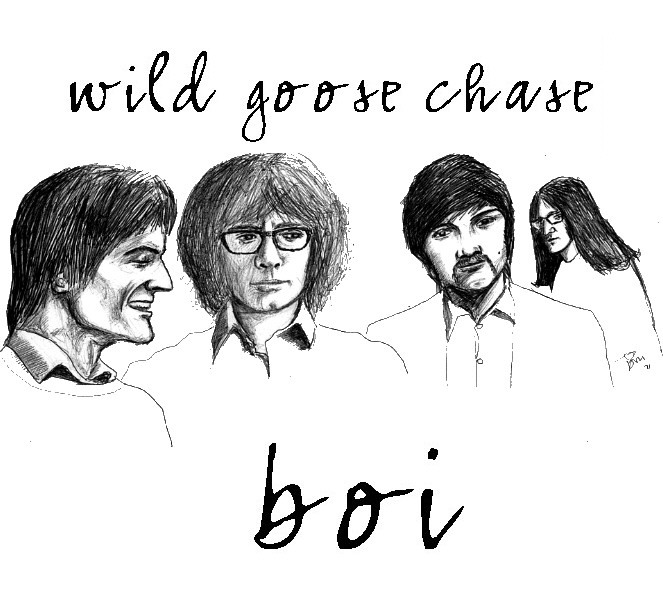 We soon wrote and produced our first collection of songs entitled ‘Wild Goose Chase’. We started to veer away from avante garde songs like ‘Technicolour Yawn’ to more melodic music influenced by Crosby Stills and Nash – and of course the Beatles. And there at the bottom, is the great man’s signature. Of course we were disappointed but despite these setbacks we continued to make music and put together “albums” of our songs on our own Raven Mad label, reaching our peak with ‘Asleep At The Wheel’ recorded in Torquay in the summer of 1972 and featuring the vocal talents of fringe band members Terry Stephens who provided great harmonies and Dave Jones who wrote amazing songs like ‘Transvestite Hitch-hiker Blues’. But all good things must come to an end and after the aptly named collection, ‘The End of Civilization As We Know It’, the band split up. Drew went on to have a career as a singer/songwriter in Devon and is now something of a legend in that neck of the woods – his ‘farewell’ concerts at the Babbacombe Theatre were sell-outs. He can be found most Sunday nights packing them in at the Hole In The Wall pub where he sings with a variety of other talented musicians. Drew recently released his first CD which included a song we wrote together all those years ago. It’s called ‘Things Have Changed A Lot’, a title that resonates today as we remember George Martin – the man who turned down The BOI. Below is a video featuring Drew’s recording along with movie footage of The BOI. Drew’s CD makes the news. 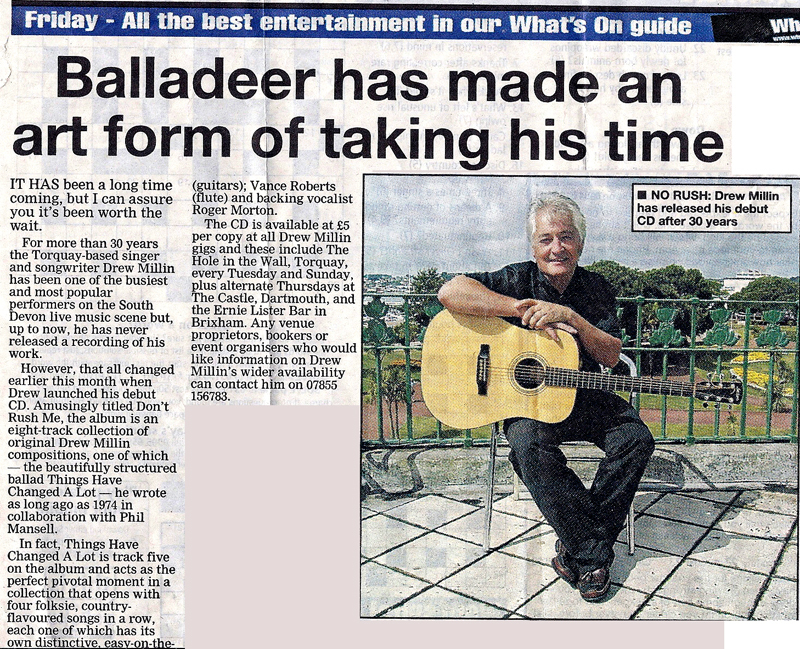 A cutting from The Herald Express. I'm a writer, photographer, illustrator and film-maker with a Masters degree in Multimedia & Information Design from the University of Wales, Newport. I'm also volunteer PR Officer with Newport Playgoers Society who own and run the city's 400-seater Dolman Theatre. I trained at the London Film School where I specialised in script-writing, directing and animation, and had three films screened at the National Film Theatre. After teaching film-making, photography and art, I moved into the world of advertising and PR and was a professional writer. My play 'According to Claudia' was selected by Newport Playgoers Society to launch their 92nd season. It won the Award for Theatre Show of the Year 2014 presented by lifestyle and entertainment magazine Voice. It has since been published by Silvermoon Publications and is available from Amazon. Other plays I have had published include 'Poor Yorick', 'Bunkered' and 'Caddying for Godot'. Previously my one act play 'Poor Yorick' was a winning entry in a competition run as part of the Royal Shakespeare Company’s Open Stages project and was performed at both the 400-seat Dolman Theatre and Blackwood Little Theatre. Another play, 'Bunkered', was one of the winning entries in a competition judged by Welsh playwright Frank Vickery. 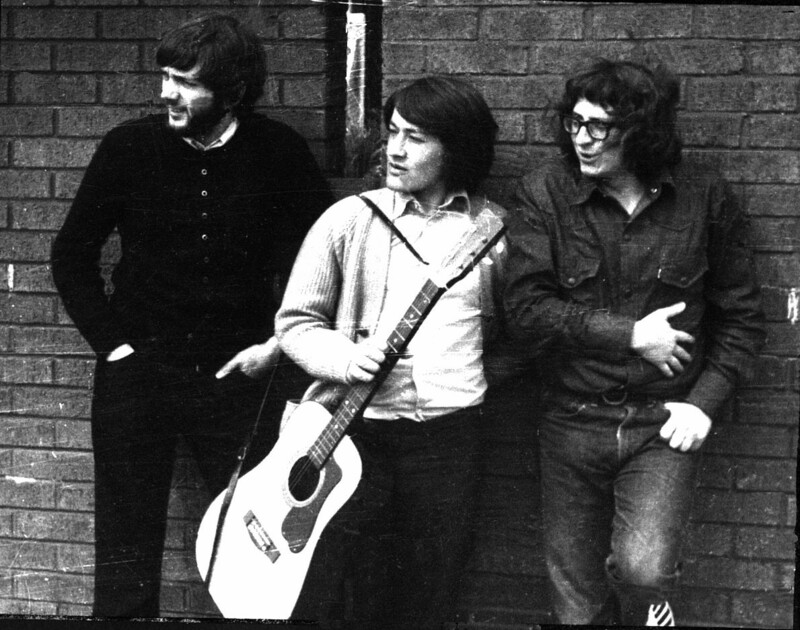 This entry was posted in Uncategorized and tagged 1960s, AIR London, Crosby Stills & Nash, demo tape, Devon, Drew Millin, Frank Zappa, George Martin, John Peel, Music, Phil Mansell, The Beatles, The BOI, Torquay, Virgin Records, Wild Man Fischer. Bookmark the permalink.